In 1984, myself and fellow final year RSAMD classmates Forbes Masson and David Lee Michael, were asked to appear in Justin C. Adams' final project of the BBC Directors Training Course. I recite the poem Dulce et Decorum Est by Wilfred Owen. Between my second and third years in drama school, I got a part in the TV series Travelling Man, which starred Leigh Lawson. I played a boy called Jamie who worked on the canals and had a connection to Leigh's character's missing son. It was the first time I had ever appeared on camera, and also the first time I had ever acted in my own voice! At RSAMD, at least in those days, we never veered from using English accents, so when I had to play someone of my own age and nationality, I found it very hard! The show shot near Manchester, and it was the most exciting thing that had happened to me so far! 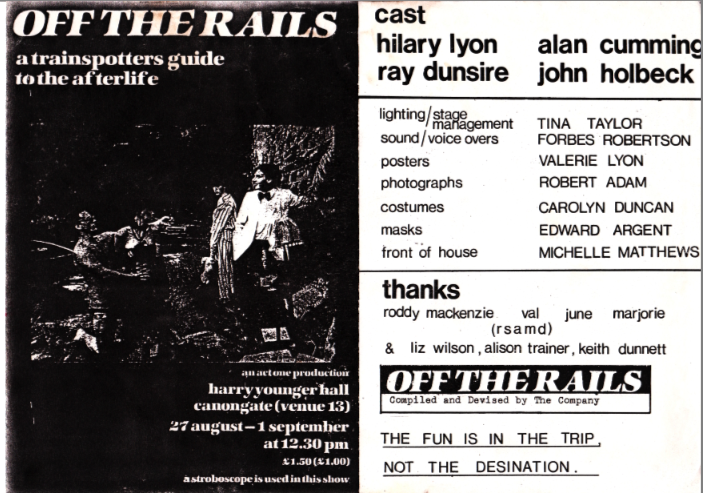 Off The Rails was a show I did with Hilary Lyon, Ray Dunsire and John Holbeck at the Harry Younger Hall - the same venue I was performing the Victor and Barry Show - at the Edinburgh Festival 1984. It was one of those devised shows with movement and bits of text from different plays and books. 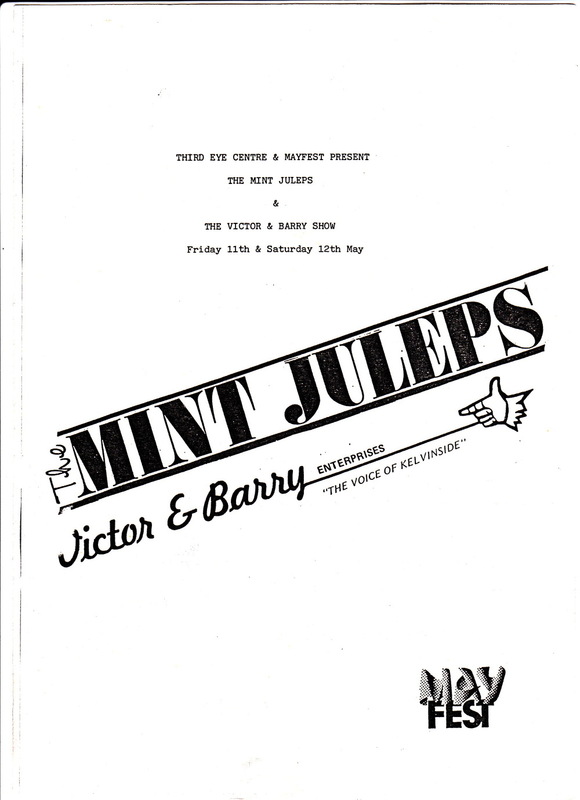 My friend from drama school, Forbes Masson, and I made up two characters called Victor and Barry for a college cabaret to entertain the final years drama students at the Royal Scottish academy of Music and Drama in 1982. The act went down a storm and we began to do it outside college, mostly in small venues in Glasgow like Hallibees Cafe Cabaret just off Byres Road. 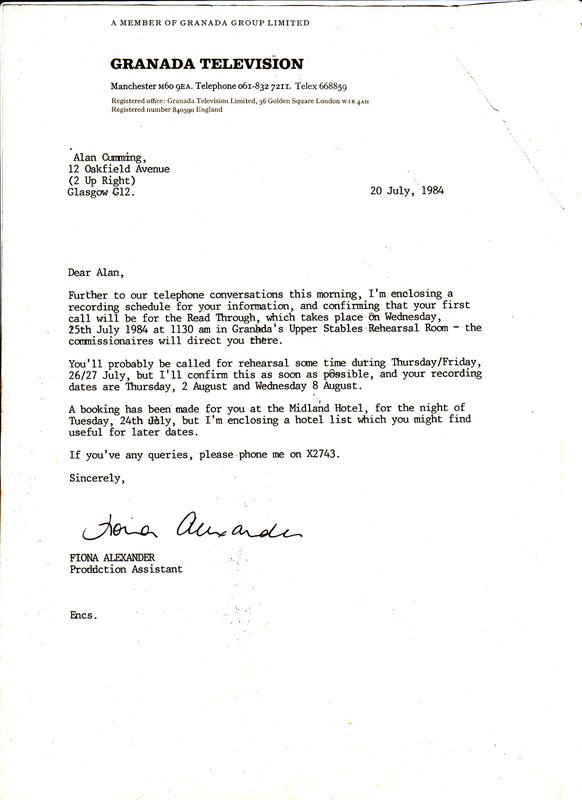 Then in 1984 we took Victor and Barry to the Edinburgh International Fringe Festival. We played in a tiny venue called the Harry Younger Hall, which the RSAMD had taken over for official college shows and other plays and cabarets that students and former students were mounting. Forbes and I did that thing that I see kids doing now and really feel for them: we handed out flyers (in character) on the Royal Mile trying to trick tourists into coming to see us. The big thing at the Fringe is to get a good review in the Scotsman newspaper. Our review wasn't particularly good, and so when we were invited to the Fringe Club to be part of a Best of the Fest night, we decided to get our revenge. We made up new words about the bad review to the song 'Lucky Star' and the chorus was 'We can thank you, Andrew Marr, that you're not as smart as you'd like to think you are'. Rather hilariously, Andrew Marr is now one of Britain's foremost political journalists in print and on TV. See me talk about this first Edinburgh experience in the video above, which I shot as Edinburgh Festival Ambassador in 2009.